The Markdown Basics document will help you get up to speed with a simple markup language called Markdown. You can easily convert markdown files to other formats such as HTML and PDF. Since markdown is much easier to write than HTML, it is a great way to create HTML documents. First we create two markdown files. Attach these files to your assignment when you submit it. Create two html files from the markdown files. Save them to disk. Preview the markdown in Atom and block copy the output. 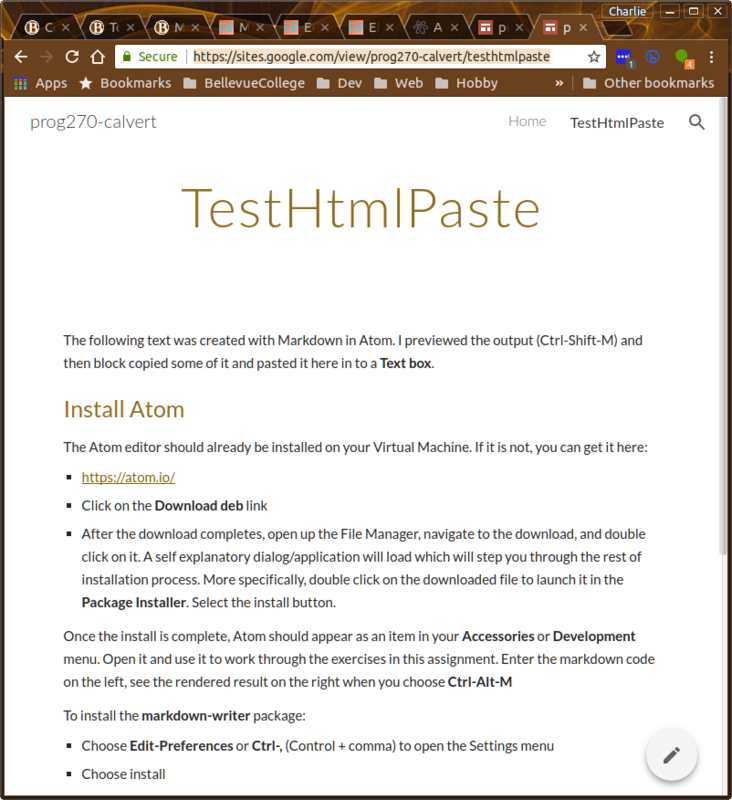 In Atom, also save the markdown as HTML. Place the HTML and your markdown in your Repository. The video does not use the Atom editor that I now prefer. After the download completes, open up the File Manager, navigate to the download, and double click on it. A self explanatory dialog/application will load which will step you through the rest of installation process. More specifically, double click on the downloaded file to launch it in the Package Installer. Select the install button. Once the install is complete, Atom should appear as an item in your Lubuntu Development menu. Open it and use it to work through the exercises in this assignment. Now it is time to setup the key bindings. Go to the Atom Settings page. There are many other ways to mark up a document with markdown. You can also translate markdown to HTML. Start with an exclamation point, a bang, and then put a few words in square brackets, then put the URL of the image in parenthesis. This is a markdown document with a list in it. 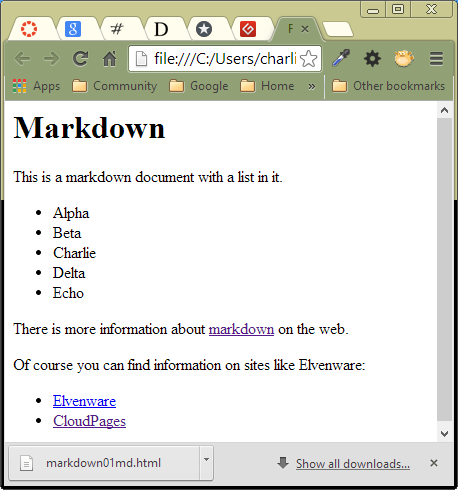 There is more information about [markdown](https://www.google.com/search?q=markdown) on the web. It can also be useful to tell markdown to leave the formatting for a text alone. For those of you who know HTML, this is similar to using the PRE tag. It can be helpful when you are trying to render code that has complex formatting, or when you are displaying poetry, that again has its own special formatting. NOTE: The exact way to turn off syntaix highlighting with a particular renderer is not clearly defined. Here I have used the class text. You might als try nohighlighting. Notice that putting asterisks around the author's name caused it to be rendered in italics. Putting two asterisks would make the text appear in bold print. If we are having trouble with backticks, we can also just use a standard HTML PRE tag. We can always fall back on HTML if our other choices don't work for us. Some of these sites show the HTML that can be derived from markdown. If you know anything at all about HTML, take a moment to study the HTML produced from your markdown. You can view the rendered HTML for your document by entering Ctrl-Shift-M. You can use that shortcut as toggle to open and close the rendered view. Another way to get to this command would be to press Ctrl-Shift-P and type in markdown preview. Right click and choose Save as HTML. Place the both the markdown and HTML documents in a folder of your repository called MarkdownBasics. While in Atom's preview mode for each document, select the text and press Ctrl-C to copy it. This part of the assignment is now obsolete. Do not attempt it. We should be using AWS S3 instead. Once again, here are the steps to get rendered Markdown into your Google Sites. In Atom, preview your document. Select the text and copy with Ctrl-C. In Google Sites, insert a text box into a new page. Press Ctrl-V to paste it into the Text Box. Provide links to your pages when you turn in the assignment. Don't forget to save your raw markdown and HTML code in your repository. 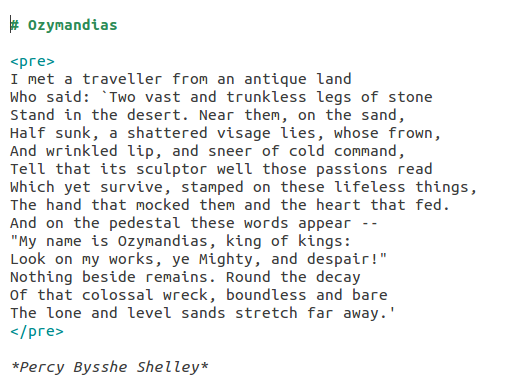 Duplicate the "Longer Document" and the Ozymandias poem in two separate markdown files. Make sure that each file has the extension .md. For instance: my-file.md. Place the markdown files you created in a folder of your repository called MarkdownBasics. Also put the HTML for these files in the same folder. Provide links to the rendered HTML in your Google site. Include at least one image on one of your pages. There is more information about markdown on the web. Take a moment to consider what we are doing. We are using an extremely simple form of markup to create nicely formatted HTML files that look reasonably attractive on the web. Markdown is flexible enough so that you can provide complex formatting for the HTML pages you render. For instance, much of Elvenware is now created with simple markdown files like the one shown above. Relatively complex tools, such as Stackoverflow, also use markdown as their primary means of formatting the text and code supplied by its users. In this class we looking to find ways to create content of various kinds that can be shared between desktop machines, tablets, and phones. We are learning that we can create documents in Google Drive, in SkyDrive, on Google Sites, and on Evernote, and view them in all three places. We can also create markdown files and have them rendered in all three locations. In other words, this is another means of sharing information between multiple devices. As we will see, having information in simple text format like this provides special advantages that are hard to achieve with any of the other tools we have looked at so far. Elvenware is the site Charlie and Margie Calvert use to publish their various writings.